Dongmyo Station takes its name from the nearby shrine, built to honor the Chinese general and deity Guan Yu (162-219). Near-ubiquitous on the other side of the Yellow Sea, shrines like these are rare in Korea where, despite its long history as an on-again off-again vassal state to China, the strong Confucian tradition prevented worship of Guan Yu from ever really taking root. 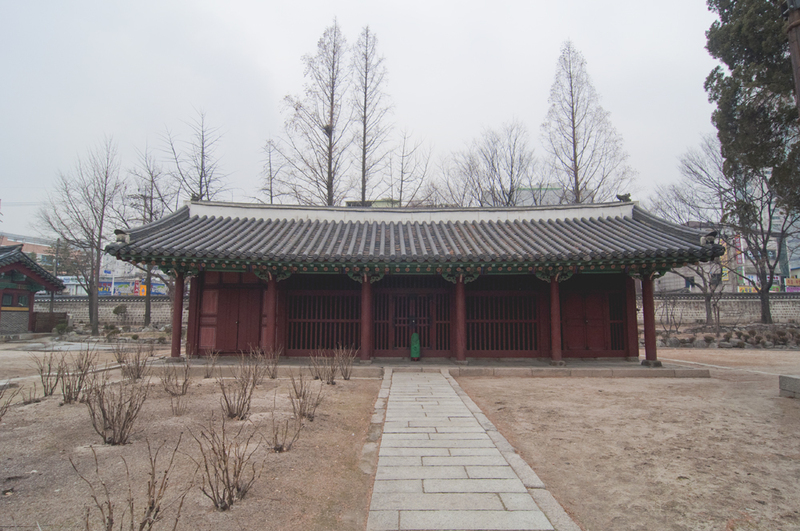 So it was probably rather reluctantly that Dongmyo (동묘) was built, from 1599 to 1601, under the reign of King Seonjo (선조), at the behest of the suzerain Ming Dynasty. A decade or so earlier, Ming forces had helped Joseon soldiers repel Toyotomi Hideyoshi’s invading Japanese during the Imjin War, a success that the Chinese attributed to the guiding influence of Guan Yu’s spirit. Accordingly, acknowledgement was expected. 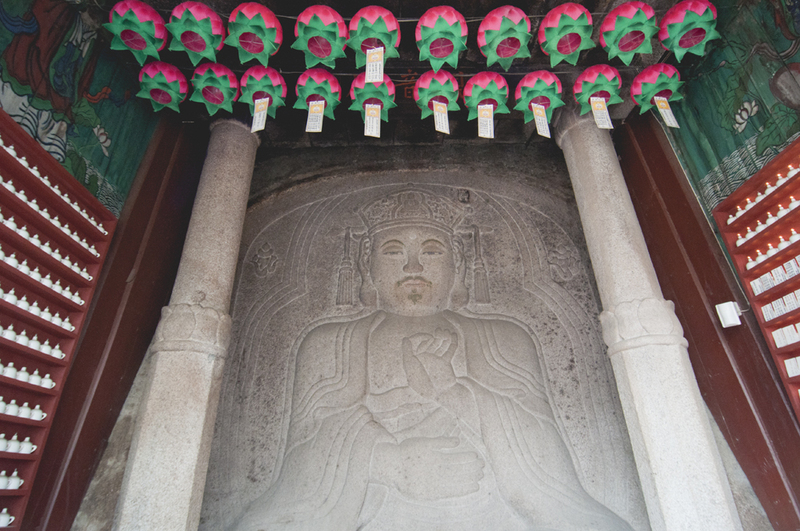 Several of these Munmyo, as shrines to Guan Yu are known, were built in Seoul, but the one just outside of Exit 3 is the only one remaining and is recognized as Designated Treasure No. 142. 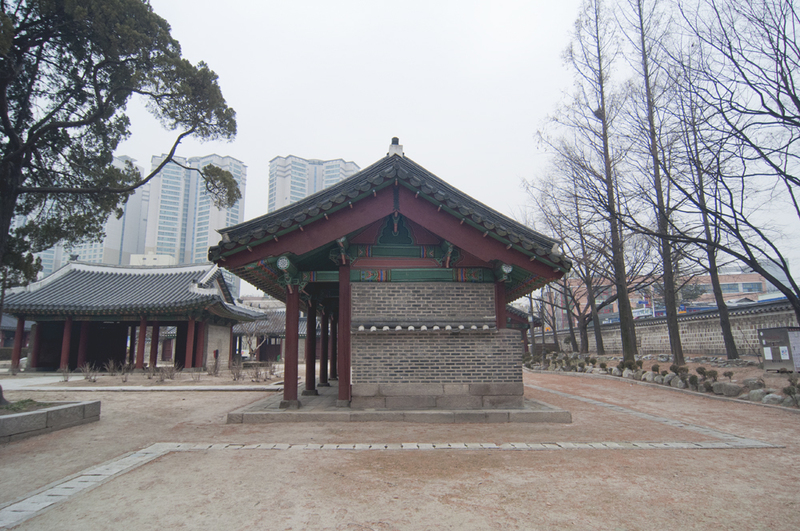 Also known as Donggwanwangmyo (동관왕묘), the main shrine is formed by two attached buildings: the front section, or jeonsil (전실), is to be used for sacrificial rites, while the rear section, or bohnsil (본실) houses the statue of Guan Yu and some subordinate generals. Distinct from similar buildings in the capital, Dongmyo’s design and decoration, predictably, incorporate many Chinese characteristics, including the intricate brickwork and its narrower width relative to its depth. Though the main shrine building is closed to visitors, you can peer in through the wooden slats to view the large, gilt, seated statue of Guan Yu, his right hand raised and his beard reaching down to his knees. To his sides are aides and retainers. On either side of the main shrine is a long wooden building, empty except for a large stone stele. Forming the fourth side of the complex’s inner courtyard is an inner gate, the walls of which bear paintings of musicians and perhaps servants. 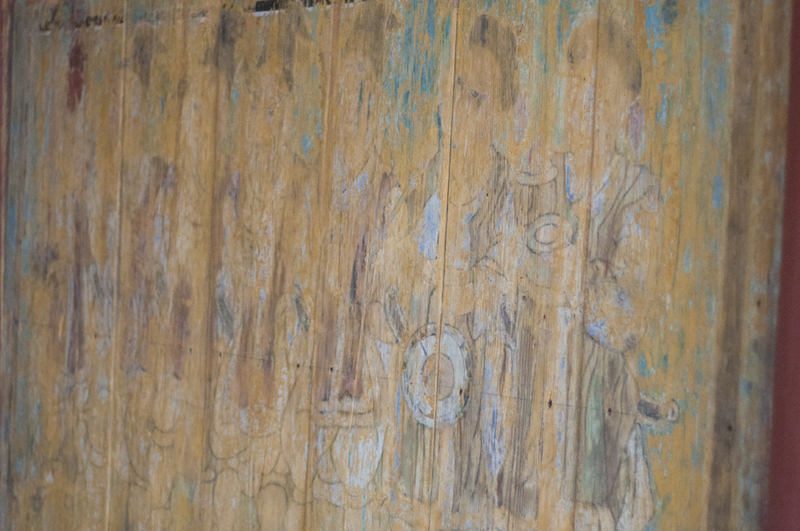 The paintings are badly faded, and it was only on the third time I walked through the gate that I noticed the faint outlines of human figures on what had at first appeared to be only slightly yellowed wood boards. Looking closely, however, I could make out some of the details: the folds in a pair of pants, horns held up by two men, another with what looked like a pair of small cymbals. 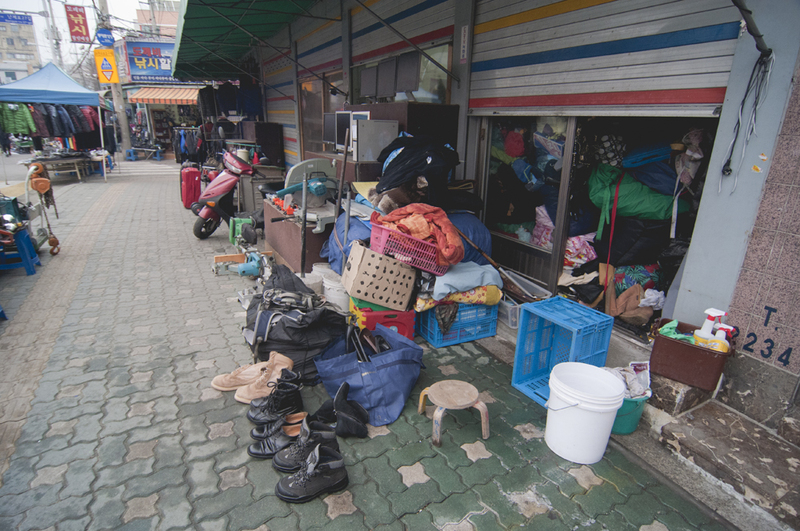 Surrounding Dongmyo is the Hwanghak-dong Flea Market (황학동 벼룩시장), which you’ll practically stumble into the moment you step out of Exit 3. 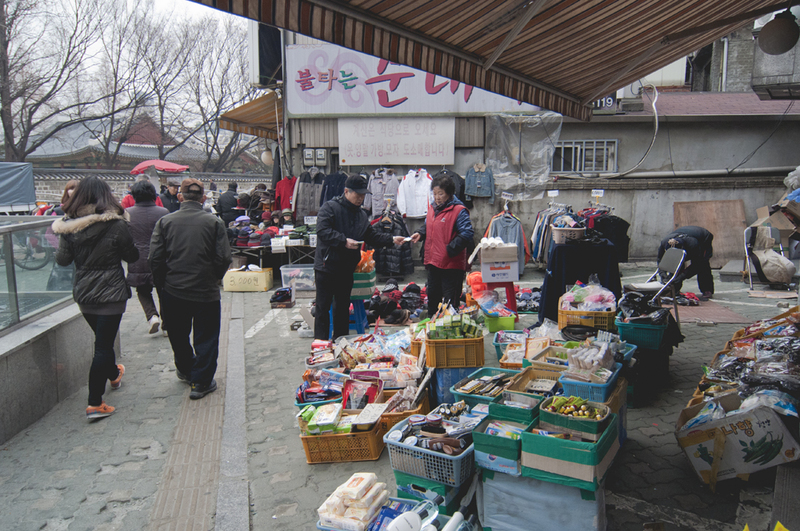 Vendors line the sides of streets between Jongno (종로) and the Cheonggye Stream, particularly Jongno-58-gil (종로58길), where the deep burgundy sides and handsome black tile roofs of the adjacent shrine peek up from behind brick walls. 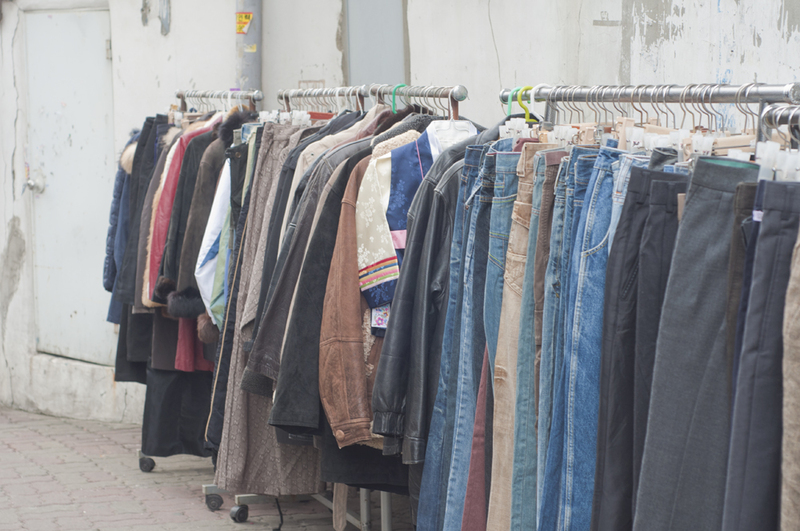 So close to Dongdaemun, you know that the flea market isn’t the end of the idiosyncratic shopping opportunities available here. 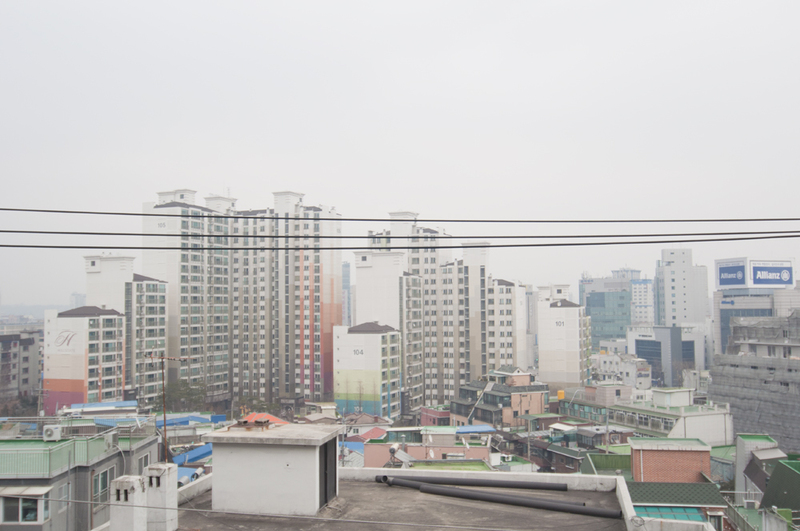 Dongmyo also provides quick access to a pair of specialty shopping areas we already visited via Dongdaemun Station. Walking west from Dongmyo Station, Dongdaemun’s unmistakable vibe, that cocktail of ceaseless commerce and age, became more and more pronounced, and as I headed toward the old eastern gate from Exit 7 the sidewalk quickly got more and more filled up with street vendors. 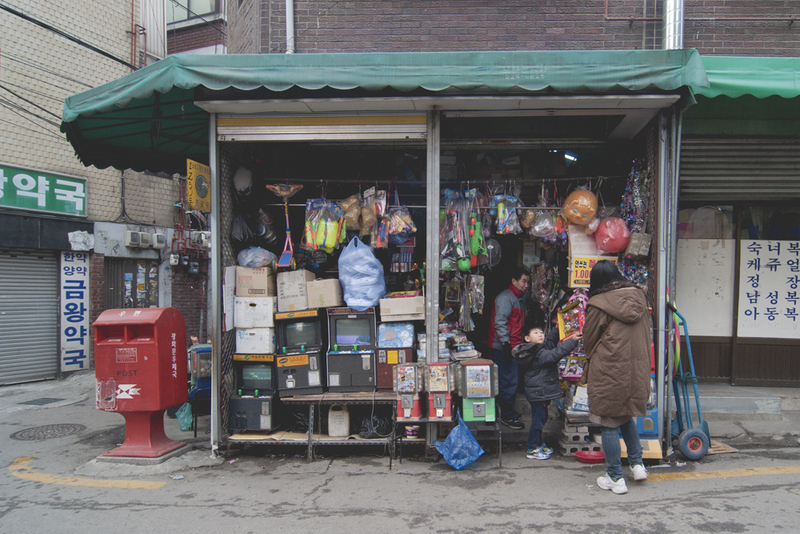 The streets and alleys south of Jongno between Dongmyo and Dongdaemun Stations are where you’ll find the Stationary and Toy Wholesale Market (문구, 완구 도매시장), Toys ‘R Us’ wild, chaotic cousin, where playthings both authentic and fake fill the area. Pink cellophane and cardboard box towers of Barbie and Barbie knockoffs stood alongside toy guns, English learning games, mountains of stuffed Brownie dogs, and Angry Bird pencil cases saying, ‘That’s the bomb!’ A string of plain white animal masks created a slightly eerie contrast with the otherwise cheery color palette dominated by bright blues, pinks, and yellows, and with the soundtrack of electronic chirps and squeals and recordings of kids singing bouncy, upbeat songs. 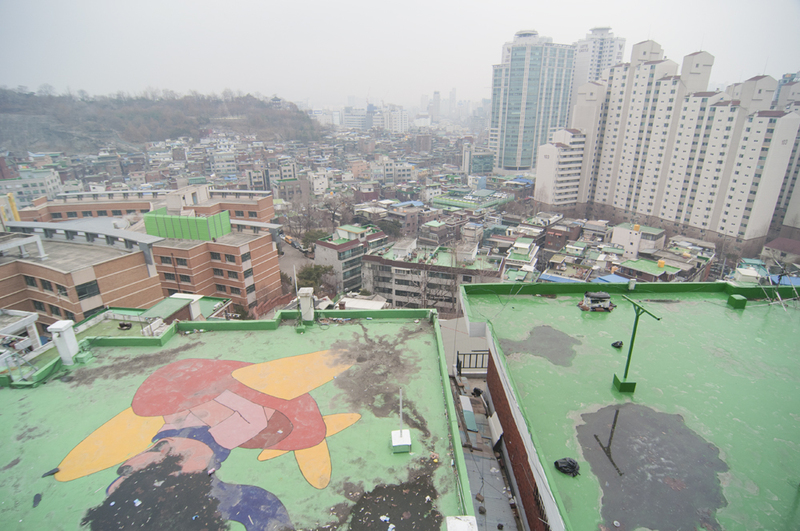 South of the toy market, is the Aquarium and Pet Market (애완동물 거리), most easily reached by heading straight from Exit 6. 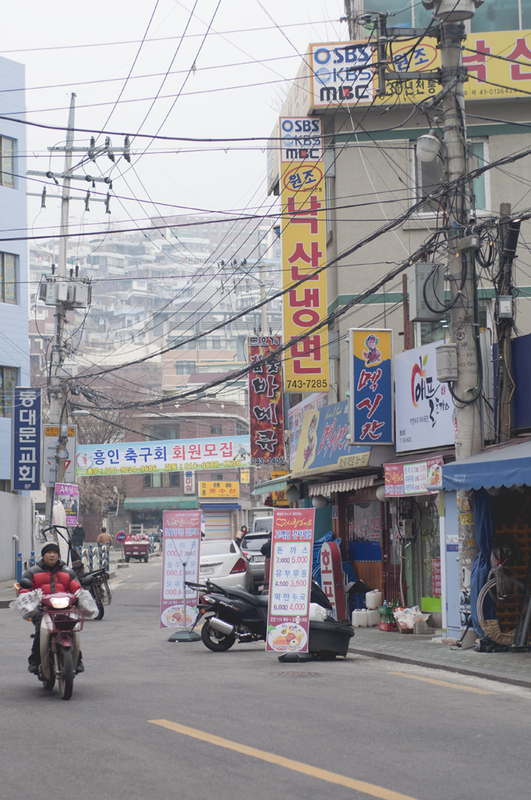 After passing a cell phone shop with a big sign that read ‘no visa ok!’ I reached the Cheonggye, across the street from which is the strip of stores that make up the market. Shimmering goldfish in tanks and the rocks and fake plants used to decorate their abodes were for sale, but so too were more exotic water dwellers like tiny aquatic frogs and water beetles (물방개). Land-based pets ranged from hedgehogs to mice to bunnies who slept huddled up together against the cold. 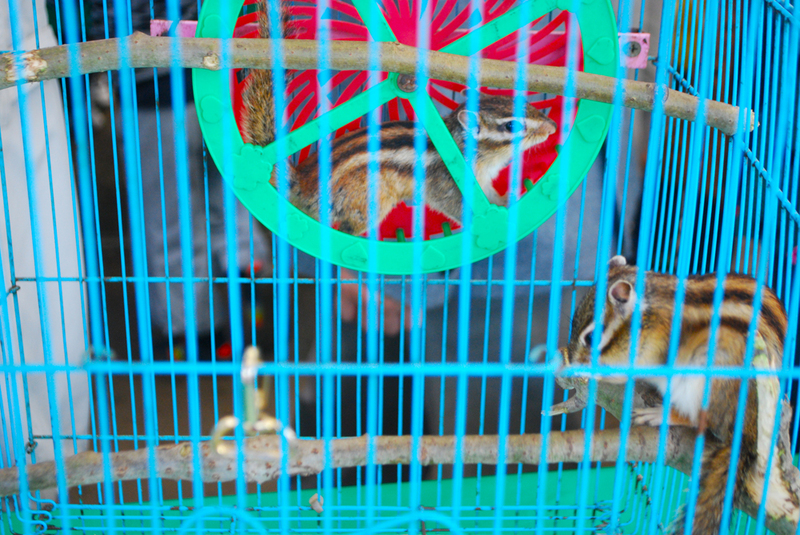 The sound of the market was a nervous prattle raised by all the birds – common pet species like parakeets and cockatiels, but also chickens, roosters, doves, pigeons, and even a brilliant gold, brown, and ochre pheasant the color of autumn. On the other side of the one-lane road, the Cheonggye Stream (청계천) continued its course toward the Han. A group of rocks created a small cascade, and upstream of this the stream’s surface was frozen. Water pouring out from underneath the firm shell tumbled over the rocks, leaving them wearing a fuzzy crown of ice and the water on the downstream side of the cascade unfrozen. South of Dongmyo Station may be full of idiosyncratic shopping areas, but to the north it’s largely residential, though it hardly lacks for things of interest; they’re just a bit harder to turn up. 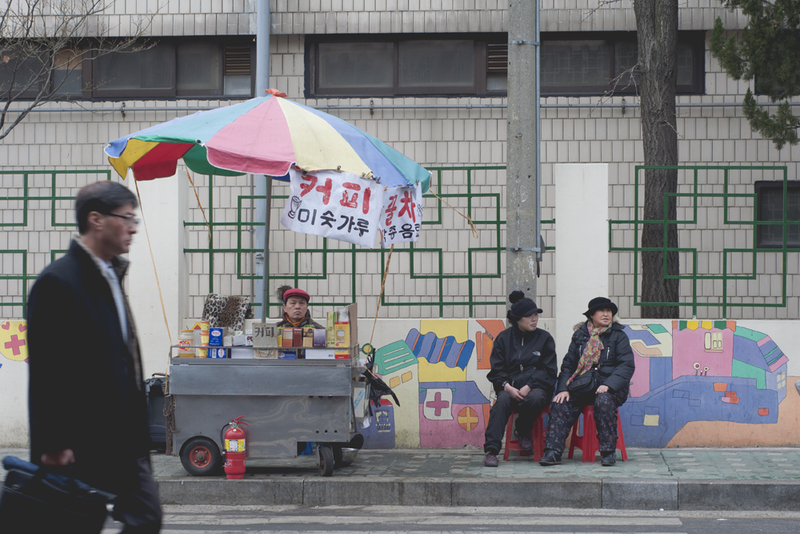 Out of Exit 9, I passed a corner market with fresh produce and big bowls of shiny black mussels set out on the sidewalk and turned left on Jibong-ro-5-gil (지봉로5길). 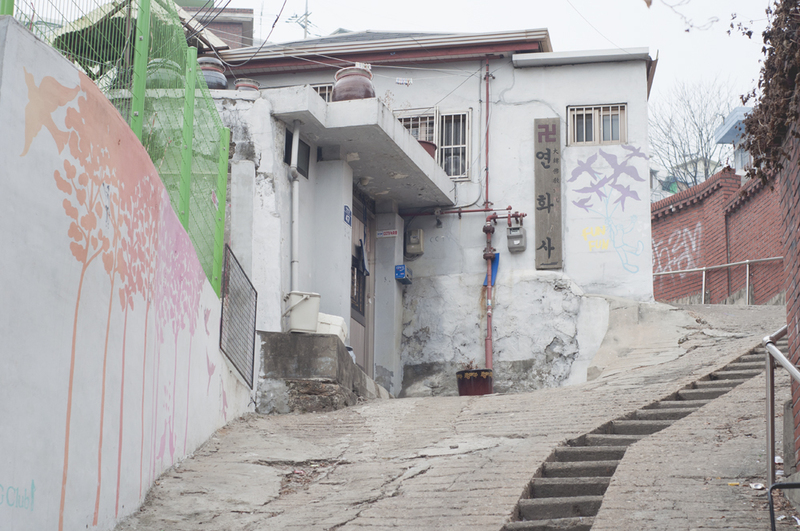 Just a few steps up on the right is Naksan Naengmyeon (낙산냉면). I first discovered this place when we visited Changsin Station, though it’s actually closer to Dongmyo. I said it then and I’ll say it again: best naengmyeon in Seoul. Purists might take issue with it, as the one and only thing they serve here isn’t true mul-naengmyeon (물냉면) nor is it true bibim-naengmyeon (비빔냉면), but something of a mash-up between the two, the only choice being how spicy you want it. Perfectly chewy noodles; copious amounts of garlic, cucumber, and pears…I could go on. Simply put, this place is the business. Come any time even remotely around lunch or dinner and be prepared to wait. Lines often go out the door. 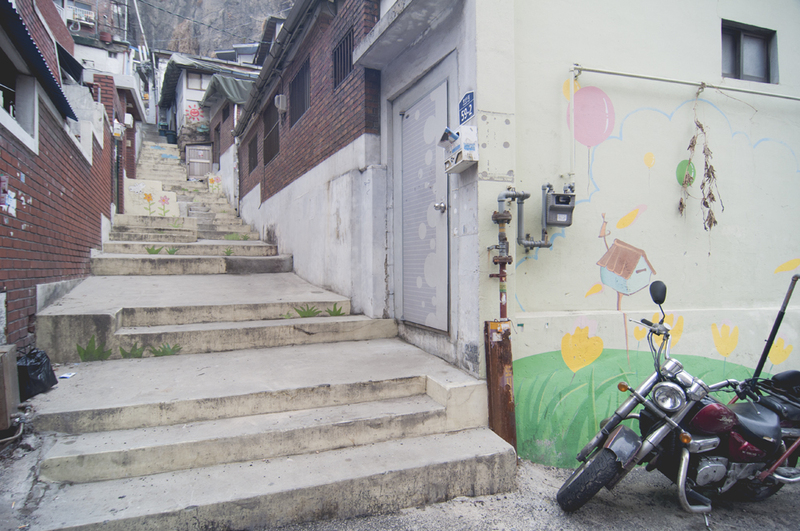 For no reason other than simple curiosity I followed Jibong-ro-5-gil past Naksan Naengmyeon, as it wound through the neighborhood, turning into a street lined with delivery motorcycles and mopeds, many with bars welded on behind the seat to provide a frame for goods loaded on the back. 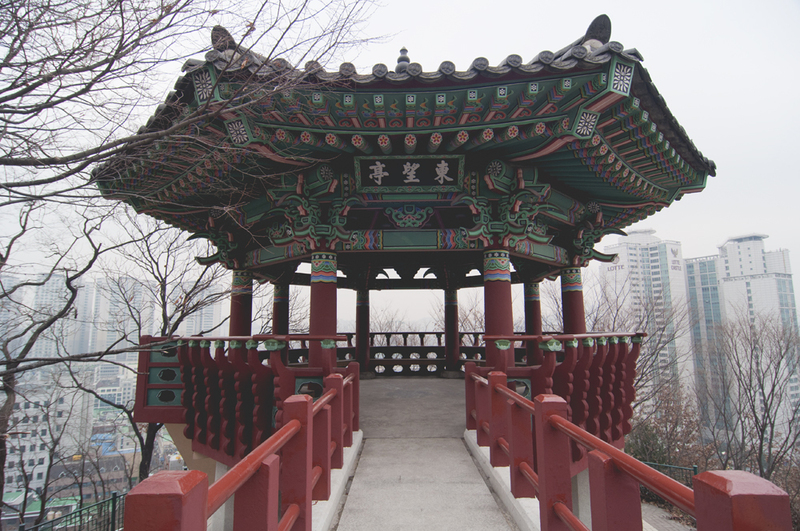 After a couple 90-degree turns I stumbled onto Anyang Hermitage (안양암). It looked small and rather anonymous, but it was there and I was intrigued by the huge rock slope that formed its southwestern boundary, so I decided to pop in for a quick look. 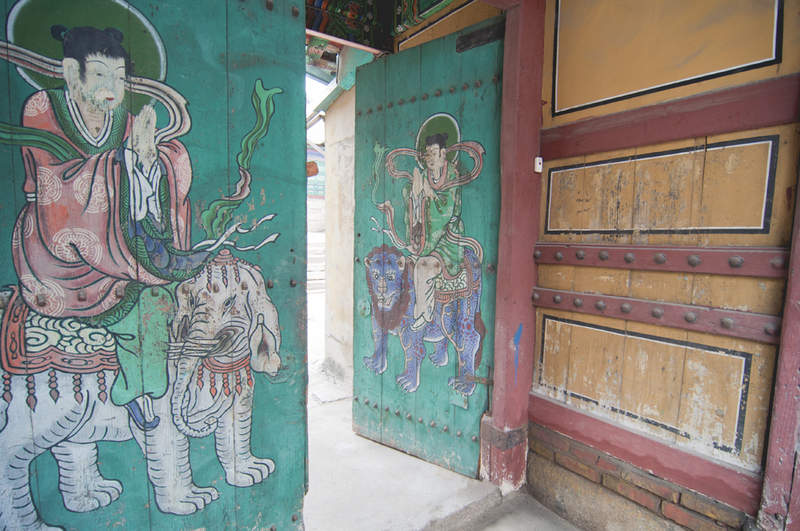 Instead of the usual fierce-looking door guardians, the pair on Anyang’s gates bore vaguely passive expressions. 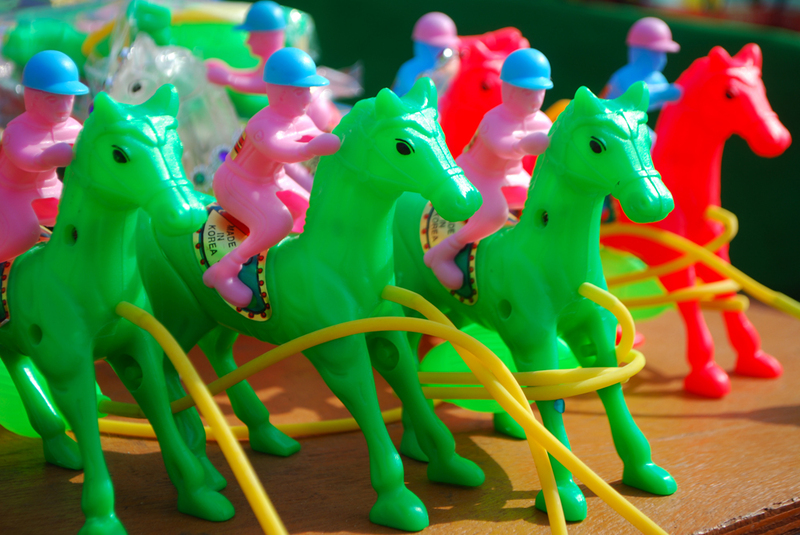 They held their hands folded in front of them and rode fantastical animals, the one on the left astride a six-tusked elephant, the one on the right atop a blue lion. The lack of aggression on their countenances seemed to validate the expectation that there really wouldn’t be anything special inside to protect, that this was the kind of temple neither human nor demon would bother with. 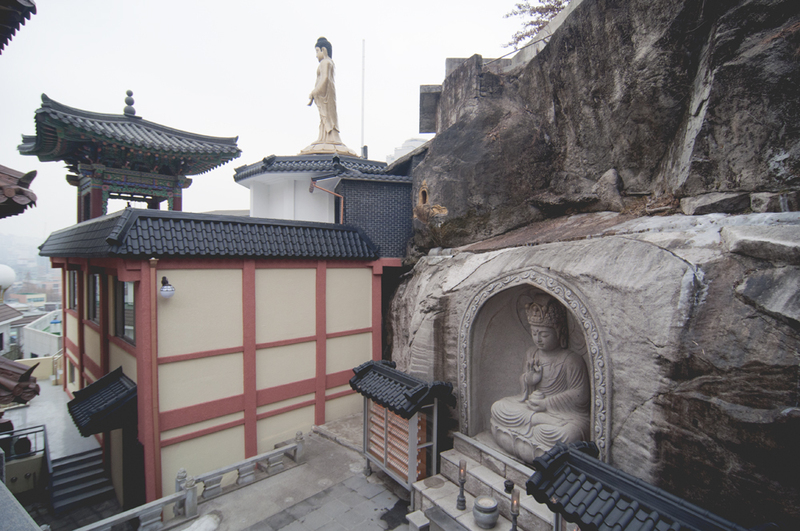 Once I stepped through the gate, however, I discovered that Anyang did indeed hold something special, the Rock-carved Seated Guanyin of Anyang Hermitage (안양암 마애관음보살좌상), Seoul Tangible Cultural Property No. 122. 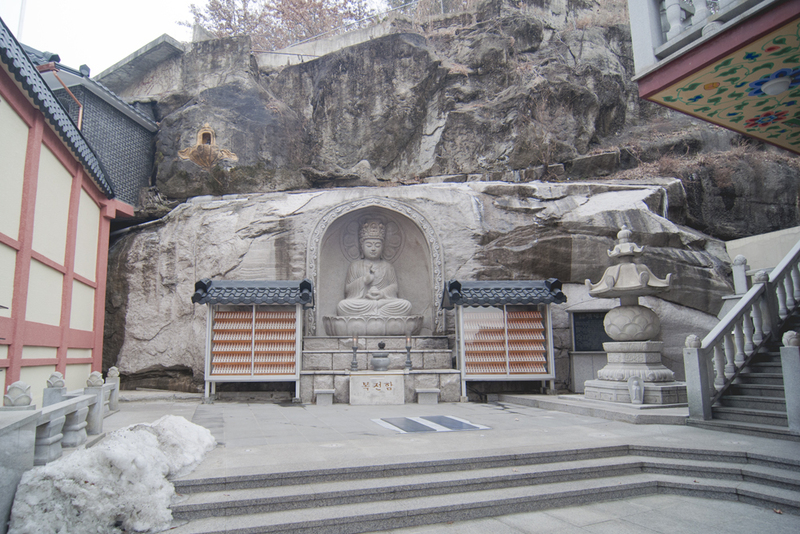 Carved onto that sheer rock face that had attracted me in the first place, the Guanyin is not particularly old, dating only to 1909, but it’s significant in that it was the last rock-carved Buddhist statue from the Joseon period. 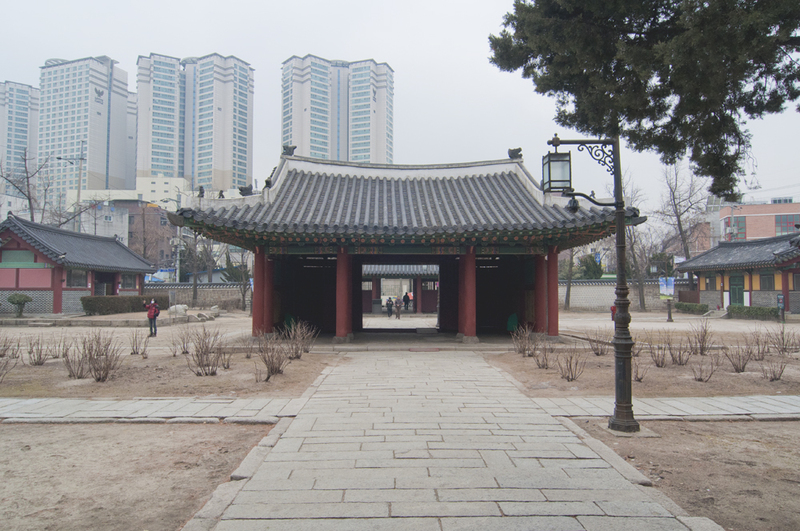 The plaque inside Anyang explained that the hermitage was slightly older, having been established by Monk Yi Seongwol (이성월 스님) in 1889. 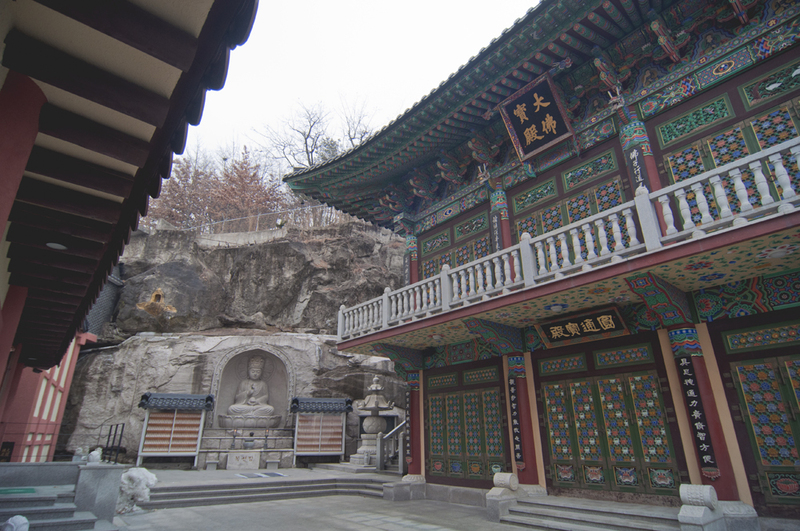 Among the structures there was the wood and brick Gwaneumjeon Hall (관음전), which had been built directly onto the rock slope to protect and enclose the Guanyin sculpture. Its doors were closed and I couldn’t see the sculpture itself, but visible outside the hall was an inscription that had also been carved into the rock: over 100 Chinese characters explaining the statue’s carving by a skilled mason. 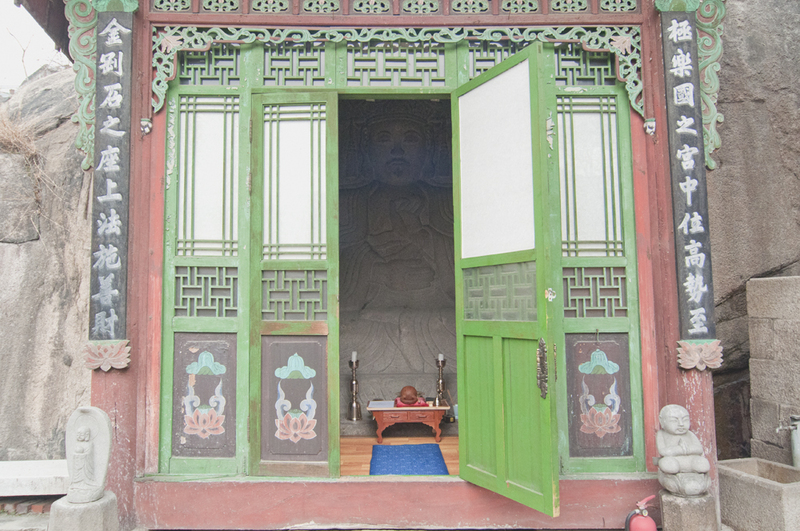 I wasn’t sure if the Guanyin sculpture was off limits to the public, but no one was around and so I decided to give a tug on Gwaneumjeon’s doors. They stuck a bit but opened, revealing a figure seated in the lotus position within a shallow recess in the rock, a small altar and some unlit candles in front of him. Unlike many Buddhist statues, this Guanyin looked distinctly Korean, with narrow eyes, rounded cheeks, and a wide nose, underneath which was a thin moustache and goatee. On his lips there seemed to be a faintly pink hue, as if a small flicker of life existed within the carving. The hermitage had a slightly mystical feel to it, created by its unexpected Guanyin image, its unusual rock formation, and its obscure location where I reckoned very few other foreigners had ever been. 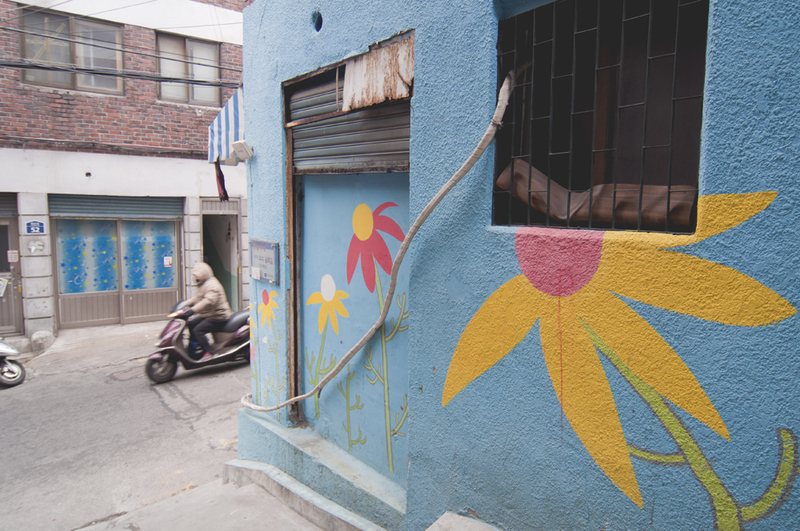 The surrounding neighborhood too was vaguely mysterious in the way that very old Seoul neighborhoods sometimes are, full of tiny little alleyways that were often nothing more than poured concrete slopes and staircases running through the narrow spaces between homes. 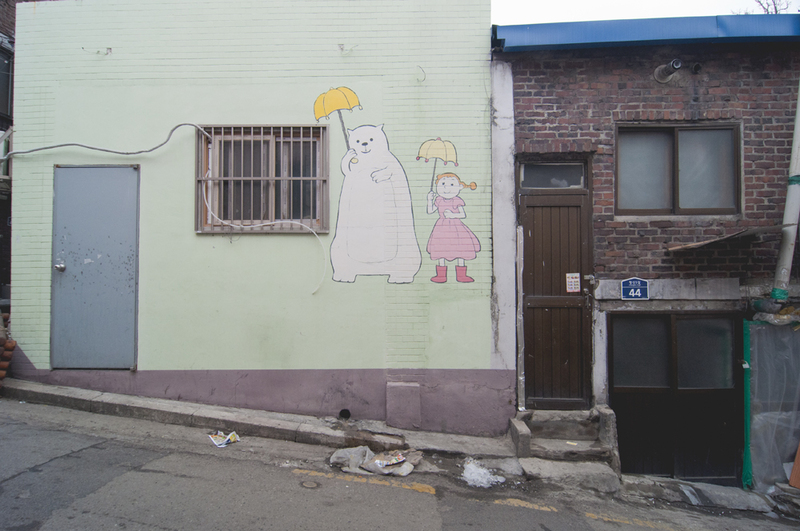 Its agedness gave things a somewhat glum feel, which someone else had noticed and tried to ameliorate, as the area was spotted with bright, cartoon-y murals painted on the walls: a man blowing snot out of his nose, two girls flying atop a honeybee, another girl and her polar bear friend holding umbrellas. 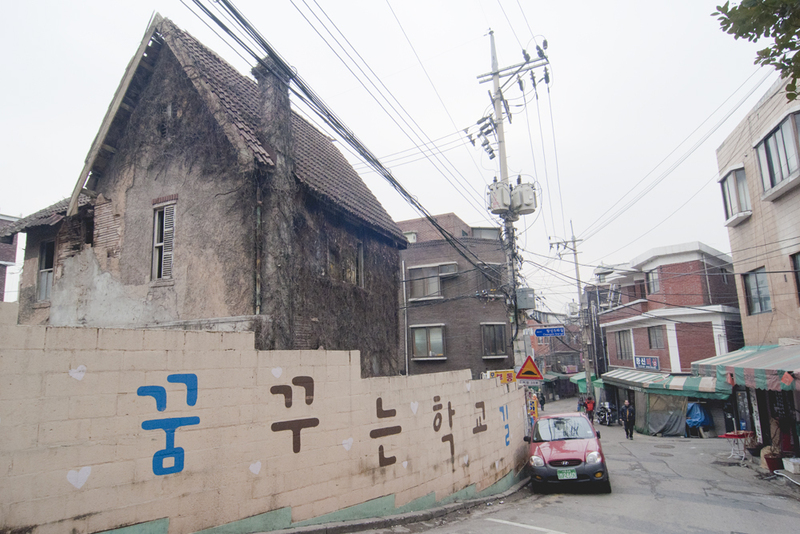 One other mural, dotted with hearts, simply read ‘꿈 꾸는 학교길’ (Dreaming School Street), but directly behind it was a derelict home that looked like a haunted house straight out of central casting. A Western-style house, it had long been abandoned, and its façade was covered in dead ivy that also climbed up a crooked chimney. Windows were missing glass, and beneath the ivy, the house’s plaster was peeling off everywhere, so badly that in some spots it had disappeared completely, revealing sections of rotting wood. 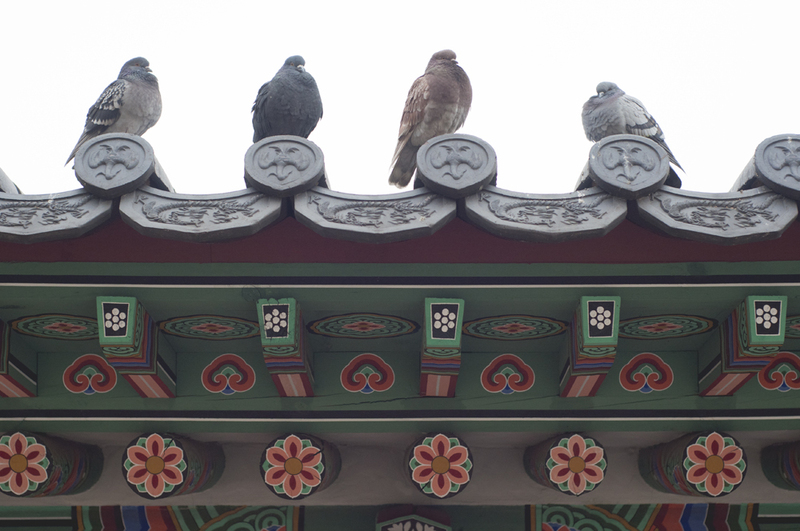 Anyang Hermitage isn’t the area’s only Buddhist spot of note. 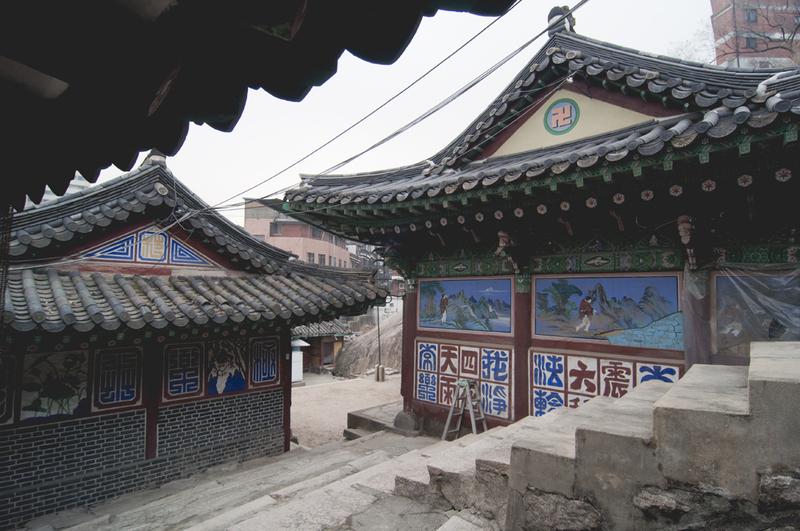 Northeast of the station is Myogak Temple (묘각사), part of Korea’s Templestay program. The temple isn’t far from the station, and it’s well signposted so isn’t too hard to find. From Exit 2 turn left onto Jongno, then left again onto Jongno-63-gil (종로63길) and take the first right onto Jongno-63-ga-gil (종로63가길). Follow this as it curves uphill until you come around a bend and spot the colorful temple façade. 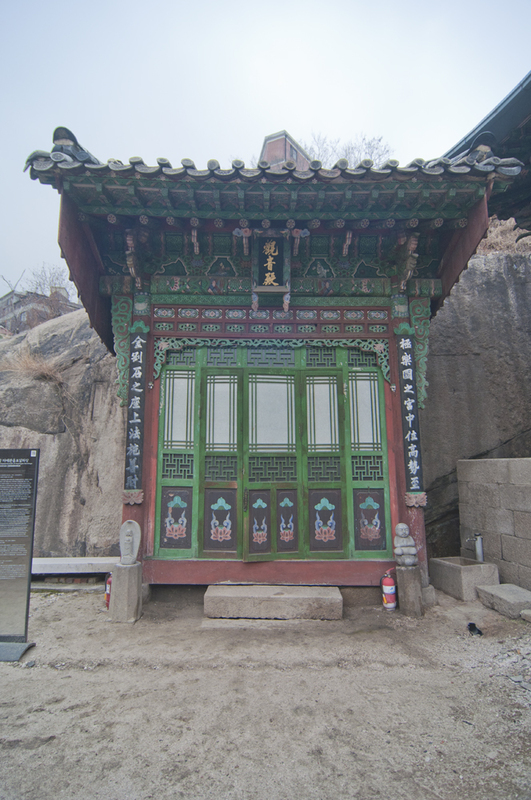 According to the Korea Tourism Organization, Myogaksa was established by Monk Taeheo Hongseon in 1930 in a spot where it was said the building of a temple would bring peace to Seoul’s citizens. That’s a pretty tall order for any one temple, but it does its best to offer it for at least a day or two with its one day or overnight Templestays, part of the popular Korea-wide program. For details on program specifics see the link above. The temple is separated from the road and the world outside by a sturdy stone wall, but just through its doors a set of stairs to the left lead up to the temple’s courtyard. 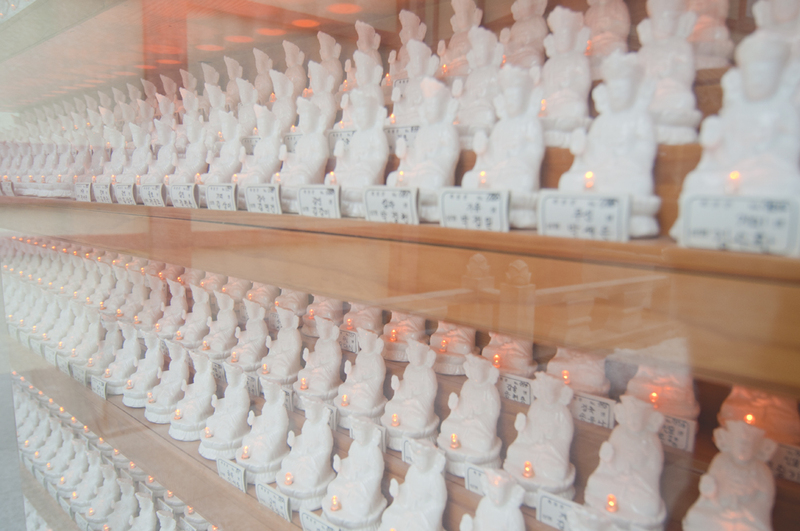 The courtyard is backed by a cliff where a stone Buddha is carved (much more typical looking than Anyang’s Guanyin figure), flanked by hundreds of tiny Buddha figurines lined up inside glass cases, each containing a tiny electric light that was lit up. In the rock wall above was a tiny gold-painted niche where a small Buddha, maybe 20 centimeters tall, sat, and further up and to the left another gold Buddha, this one standing on a rooftop, looked out over the neighborhood to the south. On the courtyard’s left-hand side was a handsome building of wood and cream and clay-colored plaster, and on the right was a brilliantly painted hall, its main door covered in blue, red, white, and orange lotus carvings. I climbed the stairs to the hall’s second floor and peeked in an open door where an enormous drum occupied one corner of the room and hanging lotus lanterns covered the ceiling from wall to wall. 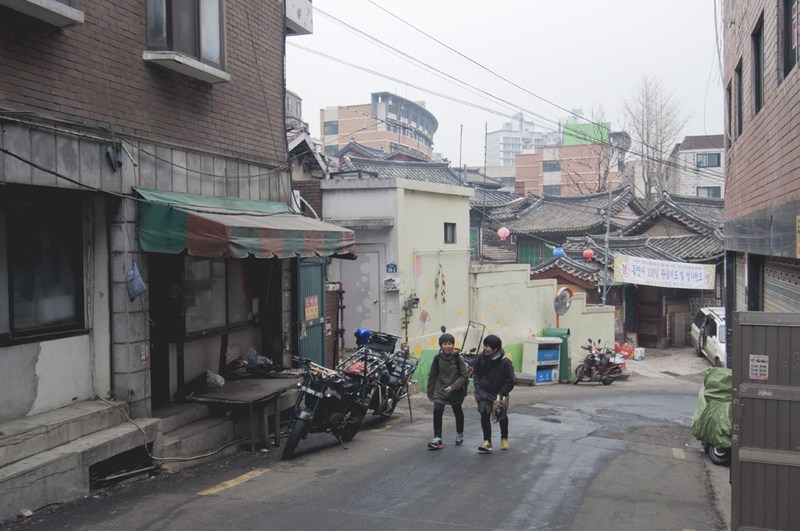 If instead of turning right onto Jongno-63-ga-gil you continue straight on Jongno-63-gil after leaving Jongno you can reach Sung-in Neighborhood Park (숭인근린공원). 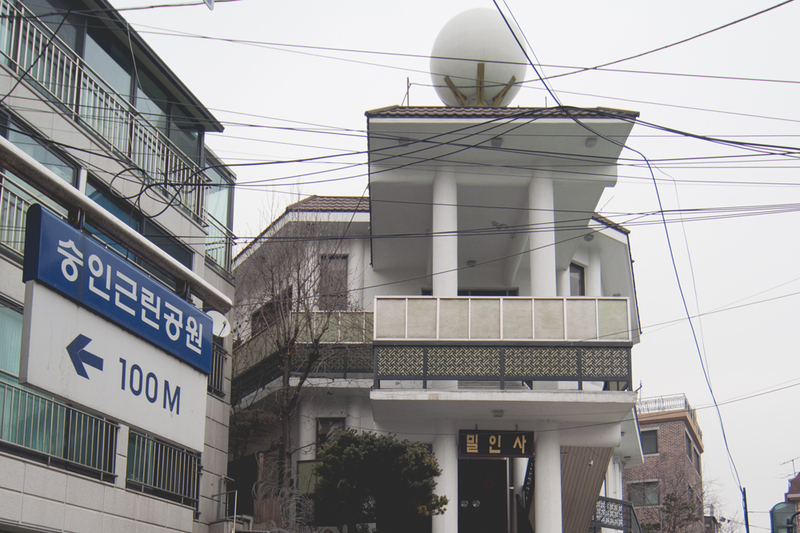 At the end of Jongno-63-gil, on your right will be Mirin Temple (밀인사) with its unusual façade and large white ball on the roof. 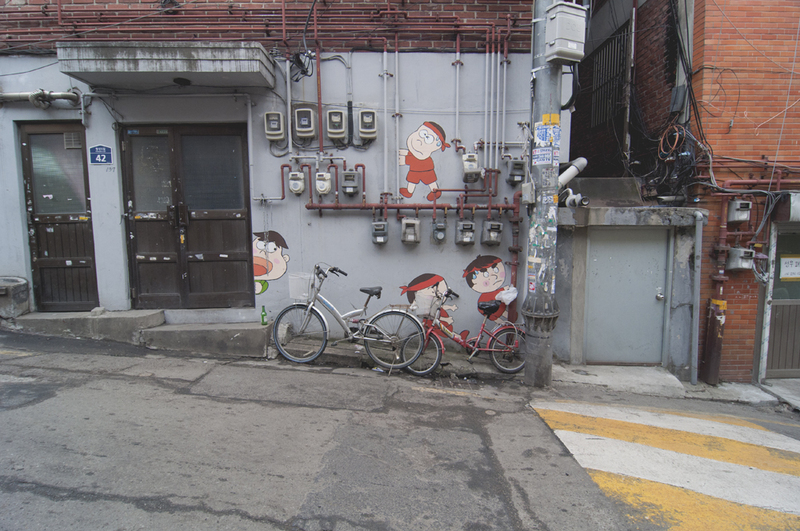 Turn left onto Jongno-63-ma-gil (종로63마길). After a couple dozen meters you’ll go up a small flight of concrete steps, after which you should immediately turn right onto a tiny brick alley (not the second right up more steps). At the end of the alley will be a black metal fence with a small gate to the left – the entrance to the park. Once inside, walking to the right took me right up behind the Buddha that stands on Myogaksa’s rooftop and then to a rough stone staircase running up alongside an empty stone water channel and into the main area of the park, a long plateau running along the top of the ridge the park sits on. 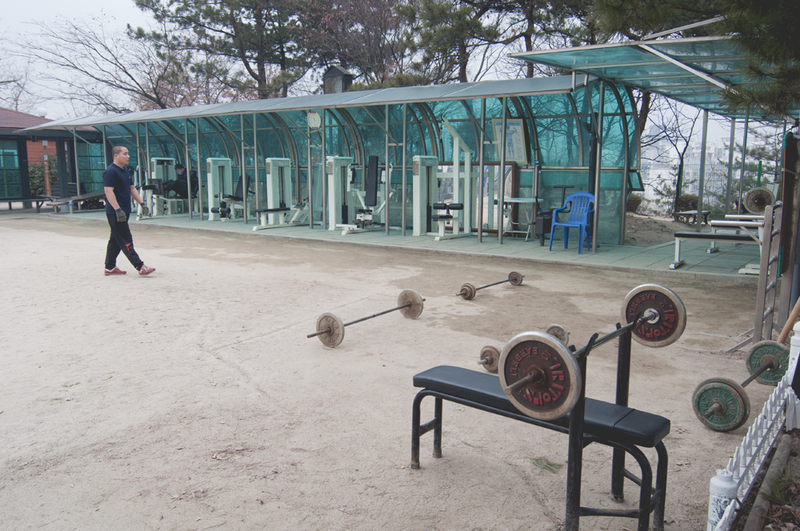 Like any other park in Seoul, Sung-in has plenty of exercise equipment, mostly of the lightweight variety aimed at senior citizens who just need to get a little movement in, but in the northernmost section of the park (also accessible from Changsin Station) there was some more serious equipment, an outdoor weight room essentially, and four ajeosshis were taking advantage of it, getting in a workout in the brisk cold. Sung-in is quite large, with quite a few badminton and basketball courts, a watercourse, and lots of trees. It also has a very charming touch that I hadn’t ever seen in a Seoul park: a little shelter with a small bookshelf labeled Dongmang Peak Open Book Café (동망봉 열린 북 카페) where visitors – primarily kids, from the look of what was on offer – could borrow something to read while hanging out in the park. At the park’s southern end, near where the stone steps had dropped me off, was a lookout platform, and the views from the spot were long and clear. Just below me was Myogaksa. And there was Dongmyo. 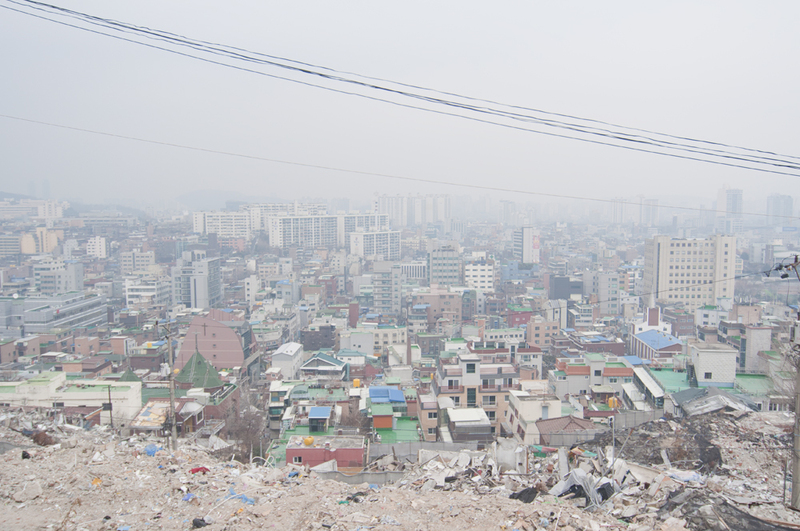 A bit to the right was Dongdaemun Fashion Town. 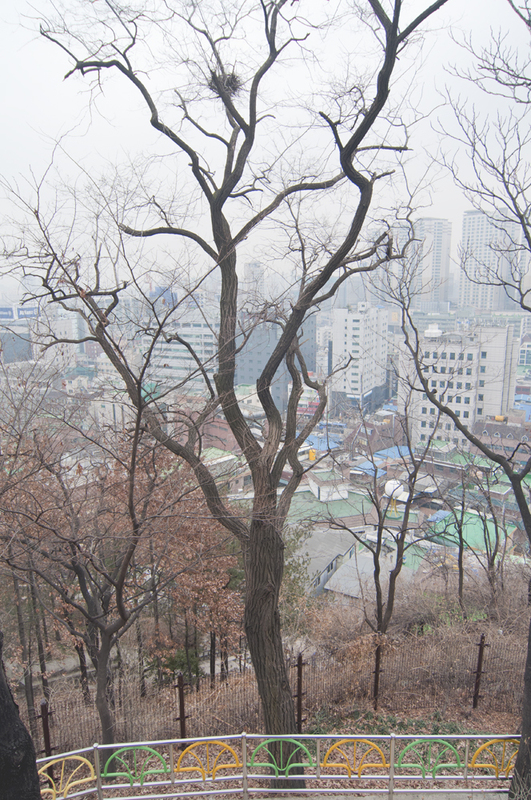 And I was pretty sure that I could even pick out the bald rock face abutting Anyang Hermitage. The city continued well away to the west, but to my left, to the east, it ended, and beyond was a ring of mountains, some of them still capped in a crown of snow. 1) If you go out exit 10 of Dongmyo Station about 5-7 minutes towards Changsin Station here’s an interesting restaurant called Yun Ganae (윤가네) that not only has economical, high quality Korean food that you can really tell is handmade fresh from fresh ingredients, but also has dishes you won’t find everywhere (I wish I’d written some of them down to list here). Most main dishes W6-9000. 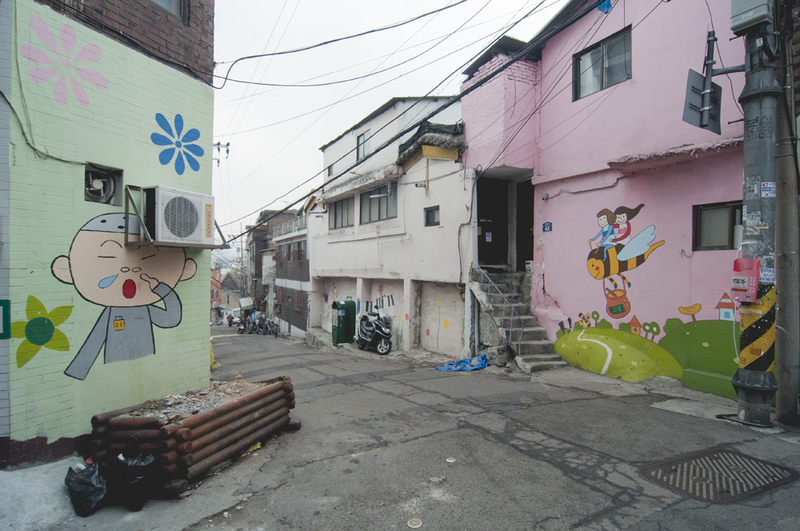 It’s on a small side alley to the right just off the main road going to Changsin station (in fact, it’s probably closer to Changsin than Dongmyo). There’s one of those big inflatable cylinders on the main road telling you you’re there. Check it out if you’re in the area! 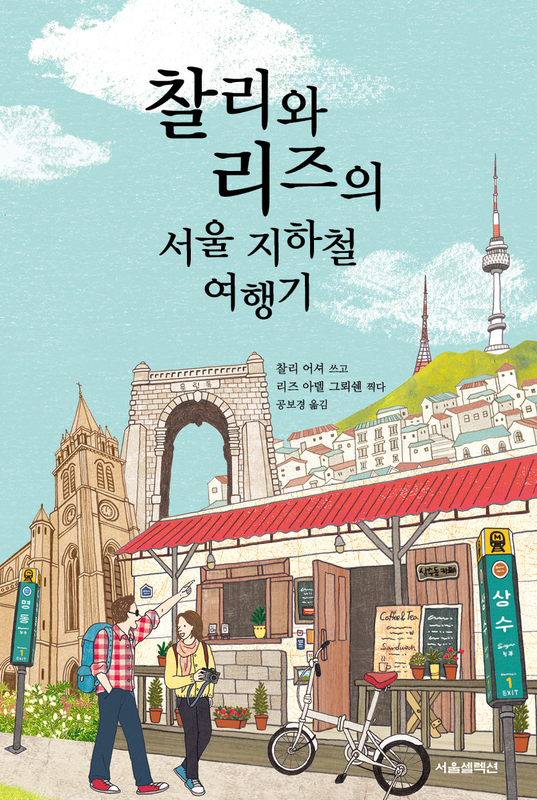 2) The hill that is behind Myogak Temple is not Nak Mountain (낙산), but Dongmang Peak (동망봉), the 동망봉 from the “Dongmang Peak Open Book Café (동망봉 열린 북 카페)” that you mentioned in your post. Locals (the few locals who know about that park, that is!) 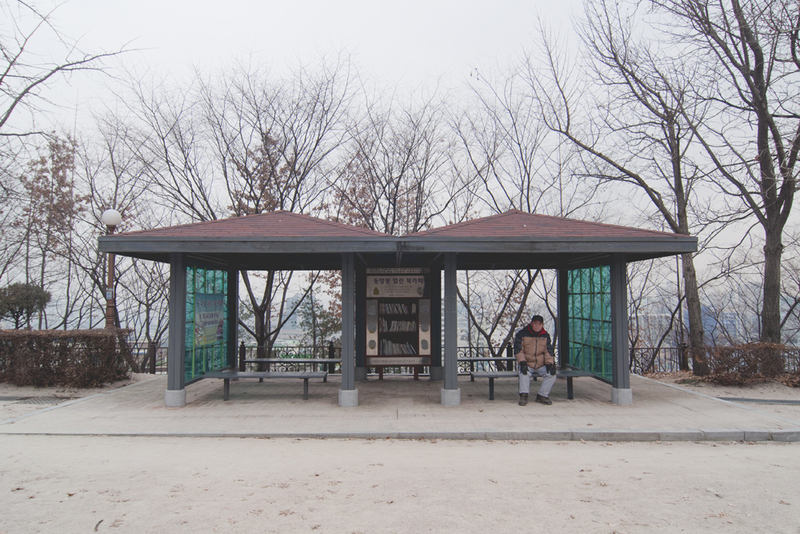 know it as Dongmang Mountain (동망산). 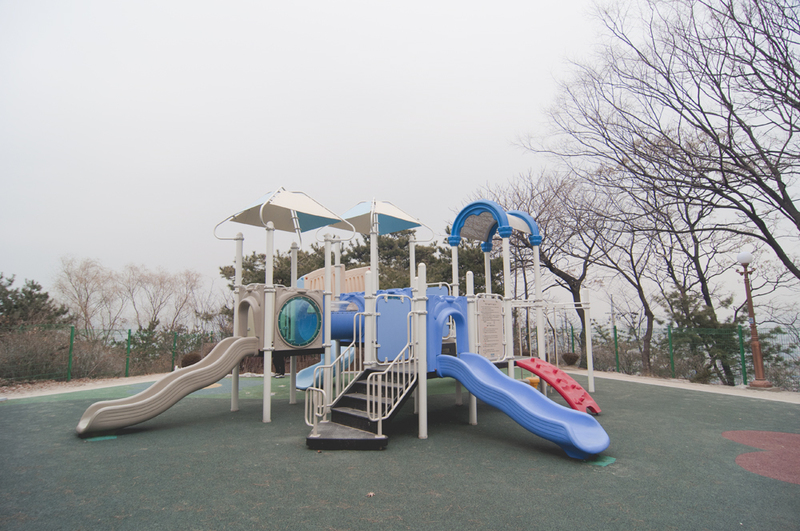 I don’t know why, but nobody in the neighborhood knows it by the official name, “Sung-in Neighborhood Park (숭인근린공원),” that you correctly list in your post. Also, one of the interesting features of the park is a Jokgu (족구) court on the west side of the hill (the opposite side from Myogak Temple). For those who are not familiar with it, Jokgu is a game that’s kind of like volleyball except that you can only use your feet/head/chest/knees to hit the ball over a low net. 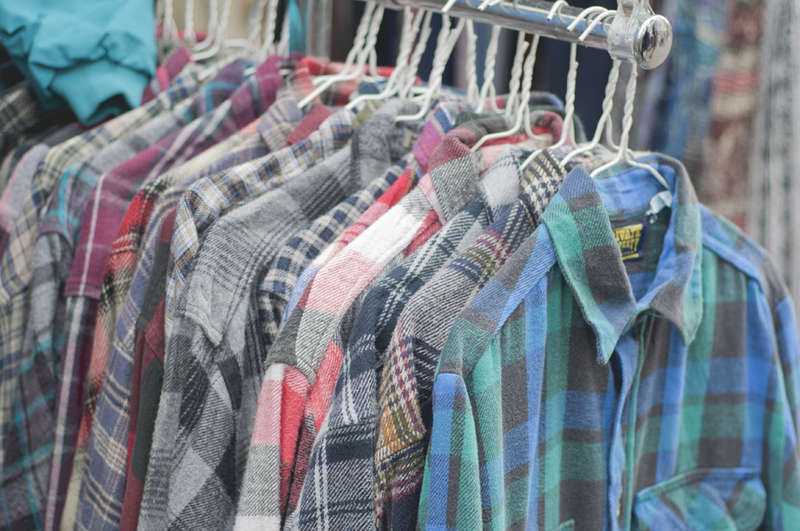 It has lost a lot of popularity in recent years and is not so easy to see these days. This is a place where you can watch it. Wikipedia has a small article on it at http://en.wikipedia.org/wiki/Jokgu. The club plays on some weekday evenings and weekend mornings/afternoons (unfortunately the schedule is really irregular, but they do play year round–including mid-winter!). 3) I know that this website is more for information than commentary, but the listing of the Aquarium and Pet Market (애완동물 거리) should have come with a strong condemnation. 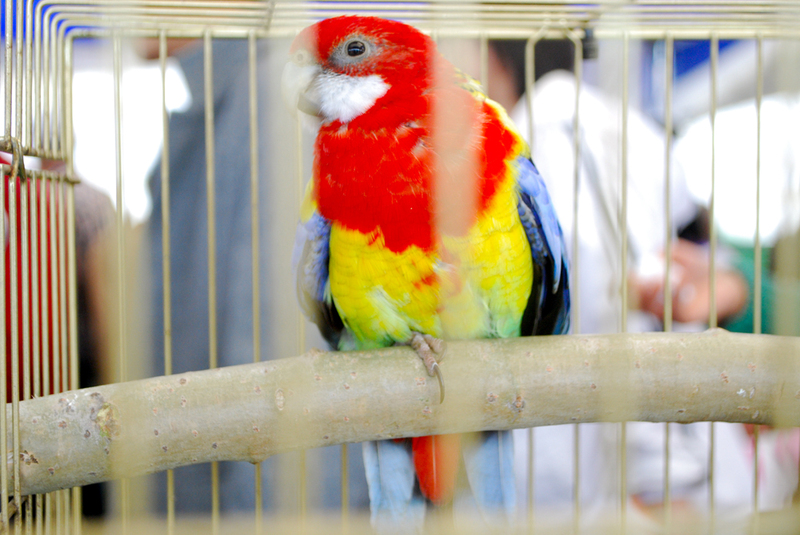 The animals are held in cruel, inhumane conditions and many of them (especially the exotic birds) have almost certainly been captured from the wild, depleting wild populations and contributing to species loss in a world where species are going extinct faster than any time in the last 65 million years. 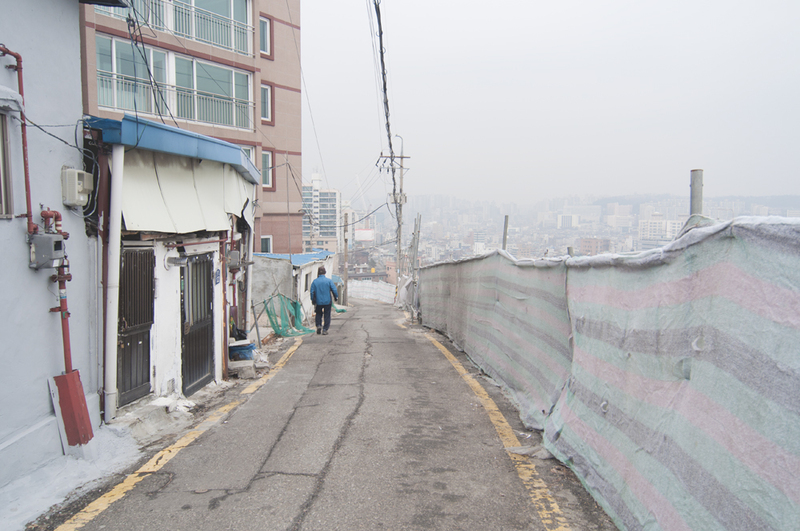 It just sickens me every time I have to walk by it (it’s on my way to the Cheonggye Stream, so I can’t avoid it without going out of my way). The authorities really should come in and shut that part of the market down. Other than that, great post. Thanks for bringing that area of town into greater view. Hi James, thanks a lot for your comment and for pointing out my mistake about Naksan. It’s been fixed! UPDATE: I mentioned in a previous comment an interesting restaurant called Yun Ganae (윤가네). 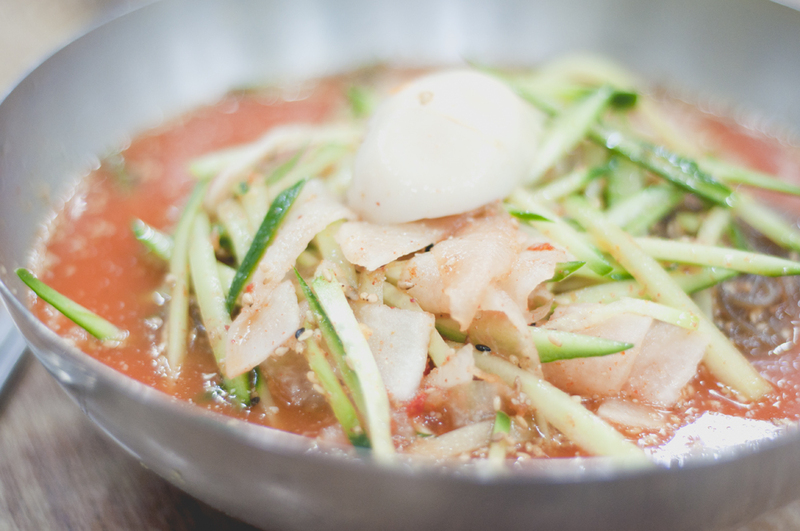 It has changed owners and is now called Hyeseong Kalguksu (혜성칼국수). Unfortunately, the menu no longer has the unique items of the old Yun Ganae. But fortunately, the quality of the food is still top notch, definitely better than most I’ve had (I tried the chicken kalguksu–닭칼국수). The “new, fresh kimchi” (겉절이) was also great (if you like kimchi), in the top 10 restaurant kimchis I’ve had in over a decade in Korea, and the ggakdugi (깎두기), daikon radish cube kimchi, was some of the best I’ve ever had. I usually don’t ever like ggakdugi , but I actually ate almost the whole dish of it here. So it’s still absolutely worth checking out. Prices are around W6000 for kalguksu. Phone number 02 743 1117. P.S. I completely second the opinion of this post about Naksan Naengmyeon (낙산냉면) having the best naengmyeon in Seoul. You’ll know what we mean when you eat there.